I am happy to be back in Melbourne. Since September 2nd, I have been to Hawaii, New York City, West Virginia and Austin Texas in addition to a trade show in Orlando. Hawaii was sales training for the pool and beach personnel and meetings, meetings, meetings. NYC was a trade show for the Health & Beauty Association; West Virginia was to see my old college for the first time in many years and visit Mom; Austin was the I-Spa Show where Absolutely Natural exhibited for the first time and Orlando was a trade show for our tattoo products. Quite an eclectic mix! The I-Spa show in Austin was particularly gratifying serving as a barometer for just how far our spa division has come since inception in 2003. 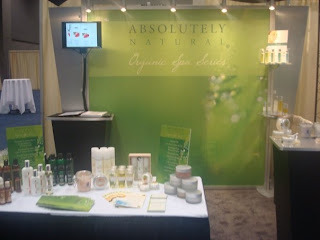 This was the first time we had exhibited at I-Spa although I have been to several shows and gave seminars at a couple on natural products and private labelling. As a first timer, you really can't expect to be highly recognized by show attendees, but we were! Despite being in the back corner of the massive hall, we were busy the entire three days. In fact, we were described by one attendee as the "darlings of the show". Quite high praise when you consider we had a 10x10 booth (nicely done thanks to Todd and Lindsey) next to some of the bigger company's huge islands and elaborate displays. Why does our tiny company garner such attention? I think the answer is simple. 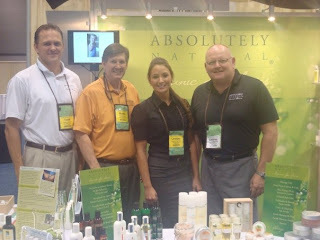 Our absolutely, 100% dedication to making the finest natural and organic formulas possible. We always use the best raw materials and never cut corners for costs consideration. Couple that with innovative ideas, excellent formulators, unparalleled service and the extras that we bring to our business partnerships... effective sales training, help with marketing and even fulfillment from web sites and 800 numbers. Finally, we can do every aspect of a resort's needs. 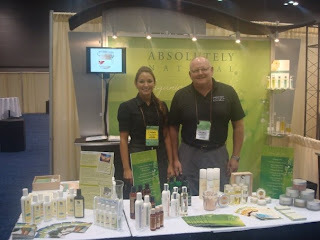 Sun care, amenities, spa products, personnel care, locker room amenities, professional sizes and retail. We were the hit of the show in Austin and I want to thank Suzanne Clements for the awesome graphics for the booth as well as Absolutely Natural staff, Lindsey Pushman, Todd Anderson and Bob Hamner for a job well done.